Looking at the picture at right, you might wonder what the big deal is  its just another map of the Yucatan Peninsula. But focus your attention on the upper left corner. See that dark-green, arcing semicircle? Upon first glance, it may not look like much, but that arc is the first actual picture of the 65-million-year-old crater left behind after a giant impact that researchers believe killed the dinosaurs. Part of a high-resolution mapping database of North America released in March, this picture outlines the 180-kilometer wide Chicxulub crater using radar interferometry from the Space Shuttle Endeavor. In the coming months, NASA will be releasing datasets for other continents. The highest point in the whole picture is about 300 meters. The semicircular trough is just a few meters deep over about 5 kilometers and represents the dissolving away of limestone along the craters rim. What happened 65 million years ago is that this thing hit out in the water in the Gulf of Mexico and blasted out a crater; but subsequently, it got covered over with these carbonates, limestone sediments, he says. The impact had altered and destabilized the rocks below, causing the limestone to fracture. That dark green line is the rim of where the crater at Chicxulub would be if there were really a crater there now, Kobrick says. Just below that arc are several little dots  sinkholes called cenotes. Thats an indication of how porous this limestone is and how easily it dissolves. The cenotes are preferentially strung out along the arc of this curve, Kobrick says. Tourists can scuba dive in the cenotes, traveling through the areas vast system of underground caves and tunnels. For the past 20 years, researchers have known about Chicxulub and, through ground surveying and gravity measurements, have known about the trough. In 1995, Alan Hildebrand at the University of Calgary first described Chicxulubs topographic features in a Nature paper. He noted a fracture system about 5 kilometers wide with a parallel cenote ring. On a larger version of the map, rows of trees are visible. 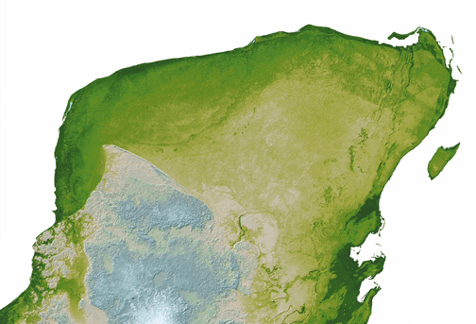 The maps resolution is almost five times better than called for in the original SRTM specifications. When geologists studying Chicxulub requested the Yucatan data from Kobrick, he didnt expect to see anything. I was really surprised to see this nice arcing line, Kobrick says.